One of the world’s great travel adventures, an African safari should be inspiring, thrilling, immersive, and of course, fun. With nearly 40% of its land protected – a combined area nearly the size of Texas – Botswana offers an ideal backdrop for a safari that is all those things and more. Boundless Journeys’ Undiscovered Okavango Delta Safari will take you deep into private reserves bordering the country’s world-famous national parks, where you will find yourself immersed in remote, wildlife-rich areas, with flexibility to explore off-road, get out of the vehicle, and embark on a real adventure. Whether learning about southern hemisphere constellations during an after- dinner guided stargazing session, or descending into an underground hide for up-close views of thirsty elephants from ground level, or walking with the safety of an armed ranger, you’ll encounter a diversity of wildlife that is breathtaking to behold — lion, leopard, cheetah, numerous plains animals, and one of the largest elephant populations in Africa — all in the company of some of Botswana’s most revered guides. For those looking to experience more in this region, optional extensions to your Boundless Journeys adventure are offered to Victoria Falls — one of the Seven Natural Wonders of the World — or to Cape Town, Zimbabwe, Namibia, and more. From abundant predators to Africa's largest elephant herds, Botswana offers incredible wildlife encounters. Our experienced naturalist guide will seamlessly lead your entire safari - adding a depth that would otherwise not be possible. Upon your midday arrival in Maun, you will be met by our guide and embark on our bushflight over the shimmering waters of the Okavango Delta. This initial flight provides a remarkable and beautifully scenic introduction to one of the world's most unusual ecosystems. The Delta represents life at its most fertile — abundant water, sunlight, and rich soil combine to form a paradise bursting with life and a landscape of indescribable beauty. 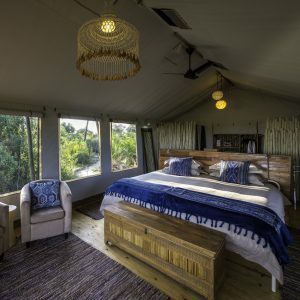 By mid-afternoon, we arrive at our home for the next two nights, a comfortable, cozy five-room permanent tented camp located in the private Jao Concession, deep in the heart of the Okavango Delta. This area's abundant water allows for boat outings, complemented by nature walks. This afternoon, we'll start our exploration of the area by motorboat, complete with sundowners. 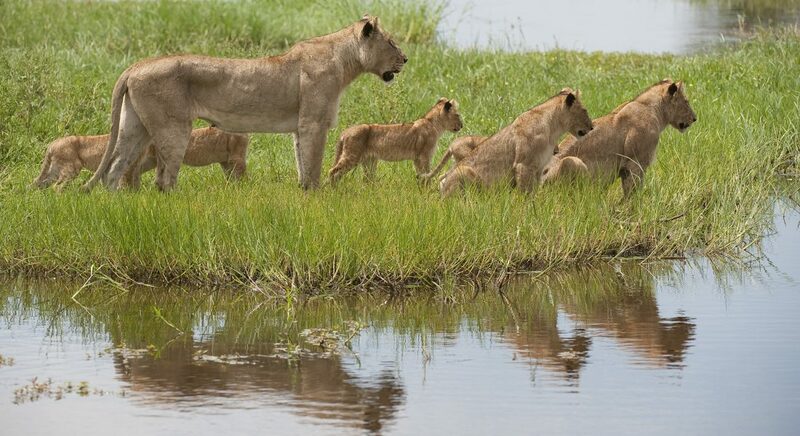 Wildlife here includes water-loving species, such as elephant, hippo, lechwe, reed buck, sitatunga and crocodiles, not to mention spectacular birding, with some 450 species recorded. All of this in complete solitude with only a few other camp visitors exploring the area; a huge advantage of staying in a private reserve. Set on a small heart-shaped island (pelo means ‘heart’) in one of the most remote areas of the Okavango Delta, Pelo Camp is an intimate, unpretentious five-roomed camp. Each spacious tented room offers two full or one king-sized bed with ensuite facilities. 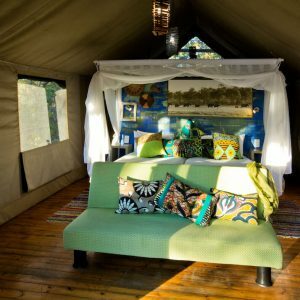 A lounge and dining area under canvas are complemented by a traditional African ‘boma’, and there is also a plunge pool. A true "water camp," Pelo offers mokoro (dugout canoe) excursions, guided nature walks, and game-viewing by motorboat. This morning, we awaken to the day breaking over our campfire. We enjoy a hot drink before heading out for our first mokoro adventure of the safari. Traditionally constructed from the strong trees of the Delta, the Botswanan dugout canoe, or mokoro, can most closely be compared to the Venetian gondola. Your guide will stand in the back and pole you through the shallow, crystal-clear waters of the Delta, while you relax and enjoy this most sublime of safari experiences. We keep our eyes peeled for both large and small denizens of the Delta — from colorful frogs clinging to reeds, to snorting hippos and graceful lechwe, we never know exactly what we'll spy around the next bend in the river. This afternoon, when we are back in camp, our guide will pull out the maps and provide an informative (but of course, optional!) presentation on the ecosystem of the Okavango Delta, before we head back out for another evening activity. As another glorious African sun slips below the horizon, we make our way back to camp for a delicious dinner. This morning we enjoy a final activity at Pelo Camp — perhaps a peaceful mokoro exploration through the waterways, exploring in the camp boat, or a nature walk in the bush. We'll then return to camp, gather our things and depart for the airstrip, where our aircraft awaits to take us to our camp for the next three nights. 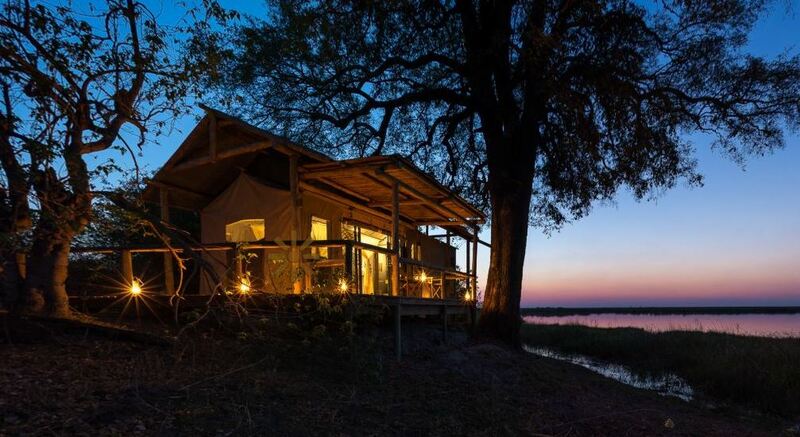 Nestled between the Moremi Game Reserve, Chobe National Park, and the Khwai River, this exclusive private area boasts an incredible diversity of animals — think herds of elephant and buffalo, along with lion, leopard and wild dog fiercely defending their territories, and plains species such as kudu, red lechwe, and herds of antelope. This afternoon, we head out on our first game drive to explore the camp's surroundings, enjoying sundowners in a scenic spot as the sun slips below the horizon, before returning for dinner in camp. Hyena Pan is a comfortable tented safari camp in the Khwai Reserve – nearly 1/2 million acres of private, wildlife-filled nature tucked between the world-famous Chobe National Park and Moremi Game Reserve, on the fringe of the Okavango Delta. 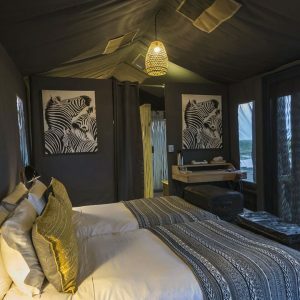 Eight spacious tents are built on raised decks and feature ensuite bathrooms with private, shady verandas and pretty views across the Hyena Pan lagoon, where wildlife of all manner comes to slake their thirst. The dining area, lounge and plunge pool enjoy the same views, and provide a welcoming area to relax and enjoy sundowners with fellow travelers. Today's plan will be based on recent wildlife activities in the area, but may include starting our day in a below-ground hide at Hyena Pan. Sometimes kiddingly referred to as "elephant cage diving," getting into a sunken hide allows even the most amateur of photographers to capture some amazing images in complete safety. A room half-buried underground, with a ground-level opening allowing for up-close photography, sunken hides allow us to capture captivating angles as elephants and other wildlife come to drink from the pan. After a relaxing siesta back at camp, we'll embark on another game drive, exploring more of our private reserve. For our final full day at Hyena Pan, we have a variety of choices, and as always our guide will make recommendations based on the movements of the wildlife in the surrounding area. For those craving a morning to sleep later, there is always the option of taking advantage of Hyena Pan's particularly good location next to a sizeable watering hole. Here one can sit with a pair of binoculars, a field guide, your camera or perhaps even a sketch book if you are feeling inspired, and enjoy an armchair safari as animals of all kinds make their way to the watering hole throughout the morning to slake their thirst. For those eager to stay on the move, a morning game drive will be offered. This afternoon, after teatime, we'll head out on an evening game drive, ultimately making our way to an elevated platform hide on the reserve. In addition to being an excellent spot for sundowners and viewing animals from a bird's eye view, the platform offers an excellent vantage point to enjoy a stargazing lesson covering the southern hemisphere constellations. 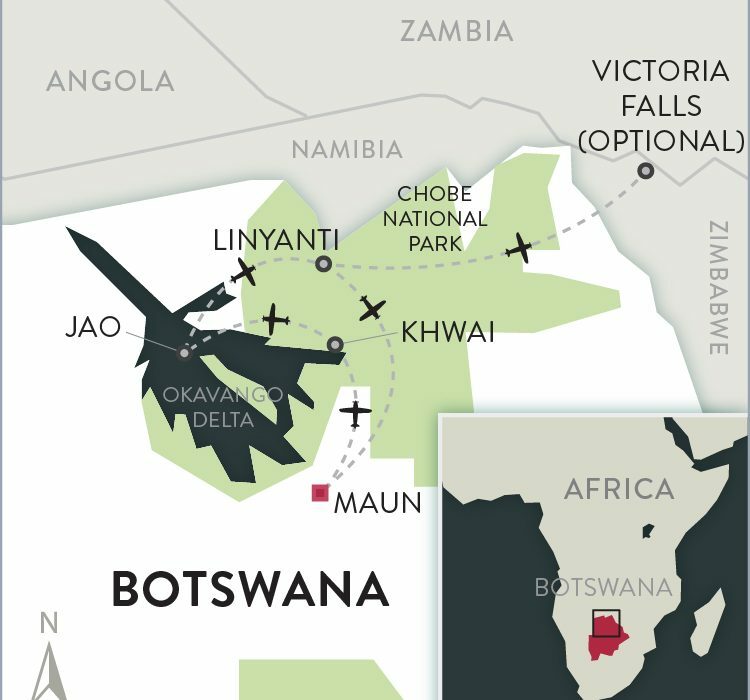 After a final activity and breakfast on Day 6 we fly northeast, departing the Okavango Delta and entering the renowned Linyanti Concession. After a short game drive we arrive at our final camp, which offers simple yet luxurious comforts for our own private use, and is set up overlooking the famed Savute Channel. Our final three nights are spent exploring this vast, wildlife-filled wilderness in nearly complete solitude. The landscape of the Linyanti region varies from floodplains to open, dry savannah and forest with sweeping views, creating a paradise for a high diversity of wildlife and bird species. During our days here, our activities will include game drives in the private northern region of the concession. Here we explore a range of habitats, from riverbanks to scrub and forest, which reveal a myriad of wildlife. In particular, the world's largest densities of elephants can be found in this region during the dry season from May to October. Impressive even in small family groups, when these animals gather together in numbers, it becomes an awe-inspiring sight you won't soon forget. In addition to the elephants, seldom-seen sitatunga can often be spotted in the waterways, as well as rare plains game such as roan and sable antelope, and of course their predators, lion and leopard, with the endangered wild dog as an incredible bonus. Our exclusive private camp in the wildlife-rich Linyanti Concession overlooks the iconic marsh and floodplains that draw in large elephant herds and much more during the dry season. Four large, airy en-suite tents are designed to recreate the style of the early explorers. The camp’s main area is the perfect place from which to watch the passing parade of wildlife and for convivial relaxation. Evenings are spent around the crackling fire under the stars or in the traditional boma. This morning our adventures will be on foot, perhaps driving a short distance from camp before striking out through the bush with a specially qualified "trails" guide. Exploring on foot allows us to learn about the smaller signs of wildlife, and we find our senses are heightened without the vehicle surrounding us. Learning some of the same skills our guides use to track wildlife — print identification and aging, dung recognition, and how to interpret signs left behind by passing animals — will allow us to begin "decoding" the bush that surrounds us. This afternoon, we depart for a game drive that will take us into the evening. When the sun has set and darkness falls, a new world of wildlife awakens. From bushbabies, to spring hares, to leopards on the move, we'll spend some time post sunset to search out the species that are rarely seen during the day. *please note that due to factors beyond our control, plans for walking are always subject to change. However, we will make every attempt to include a tracking walk from this camp at some point during our stay. Our final full day of exploring the Linyanti region will include a morning game drive, perhaps incorporating another walk along the banks of the Linyanti. In the afternoon, we'll have more opportunities for capturing unforgettable images of elephants enjoying the water from a nearby logpile hide. This evening we'll enjoy a final, celebratory dinner to commemorate our time exploring this natural wonderland together. 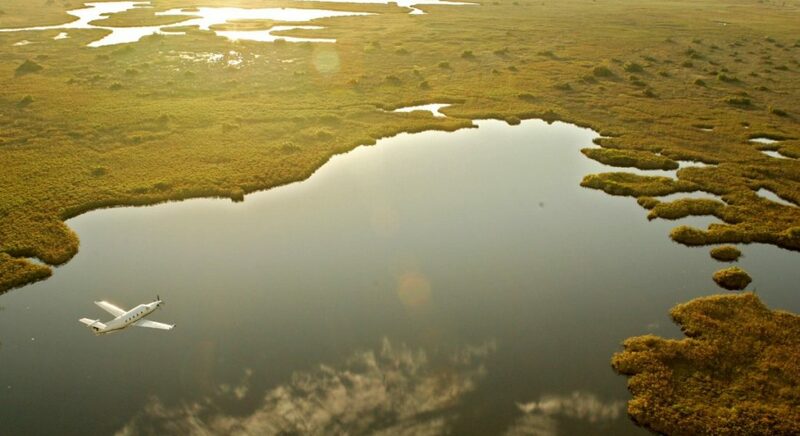 On the morning of Day 9, our final scenic bush flight returns us to Maun, where we say goodbye to each other and the shimmering waters of the Okavango Delta, in time for departure on early afternoon flights. Alternatively, you may wish to extend your trip to visit other regions; from Cape Town to Victoria Falls, Boundless Journeys offers a wide variety of extensions to help you make the most of your African safari experience. Please call 1-800-941-8010 to discuss the possibilities. Boundless Journeys' trips are designed for energetic and flexible individuals who like to be active and have a spirit of adventure and a positive attitude. 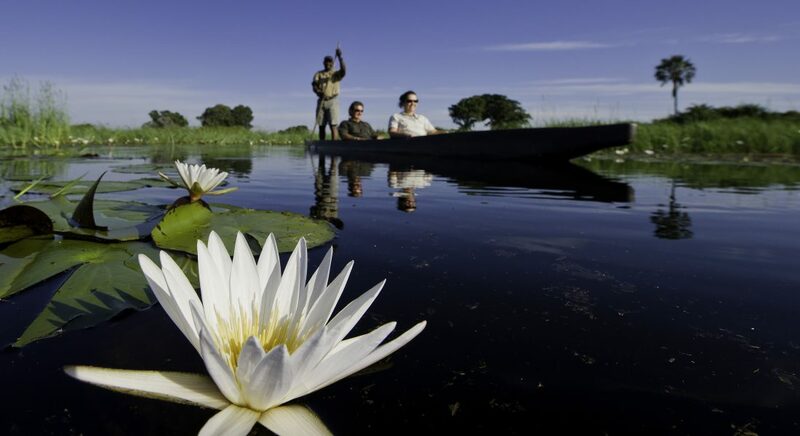 Undiscovered Okavango Delta Safari is rated 1, easy, on a scale of 1-5 (with 5 being the most strenuous). Our primary activities require little aerobic fitness, but some agility for getting in and out of vehicles and mokoro canoes, and walking through uneven terrain. This trip can be enjoyed by anyone who is in reasonably good health. We will walk where possible, but this is often determined by the local area and country regulations. NOTE: These optional walks are at your own risk, and can take you close to potentially dangerous wild animals. The winter season begins in May and ends in August. This is also the dry season when virtually no rainfall occurs. Winter days are generally sunny and cool to warm; however, during cold snaps, evening and night temperatures can drop below freezing in some areas. Please be prepared for chilly weather in theevening/night/morning and bring plenty of warm clothing, including a hat, gloves, long pants, fleece/wool top, and a windbreaker jacket. Tents and public areas are not heated, though the public areas do have fire pits, and beds are warmed with hot water bottles on cold nights. Ponchos are available for use in the safari vehicles. 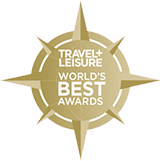 There are excellent reasons to visit Botswana at any time of year. Our Undiscovered Okavango Delta Safari is scheduled for the peak season to explore all that the magical Okavango Delta has to offer: abundant wildlife, seasonal inundations (allowing for exploration by mokoro and boat in addition to traditional game drives), and ideal weather. In May, the green season has ended but foliage remains on the trees and dust levels are low; flood waters begin arriving for the season. By August and into September, the dry winter season has begun to have an impact on both the landscape and the wildlife. The landscape is more arid in appearance although the floodwaters remain high, and the animals congregate in large numbers near the remaining watering holes. Predator and prey are often in close proximity in their intense need for water, leading to some memorable encounters. No matter when you choose to go, you will see more elephants, giraffes, zebras, gazelles, buffalos, hippos, and big cats than you can keep track of! For those with an interest in an extension trip to Victoria Falls, it is important to note that the amount of water going over the falls during the dry season is highest in the month of May, and becomes progressively less as the season advances; by August and September, there is little water passing over the Zambian side of the falls. 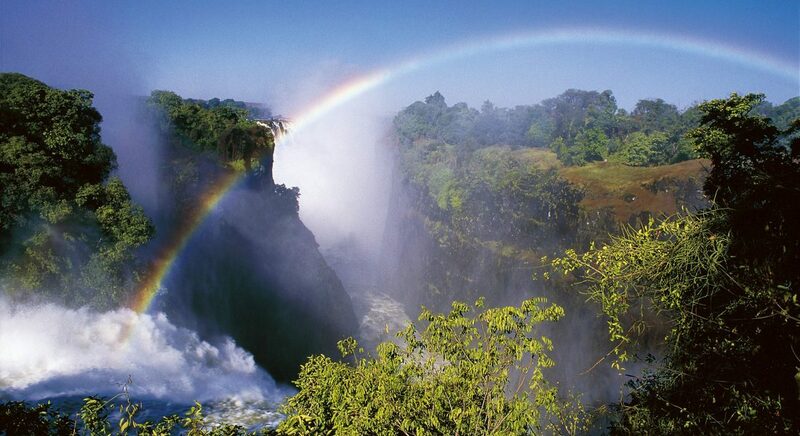 At this time, a tour of the Zimbabwe side of the falls is recommended. In either case, spending time on the Zambezi River is an ideal way to top off your safari experience. 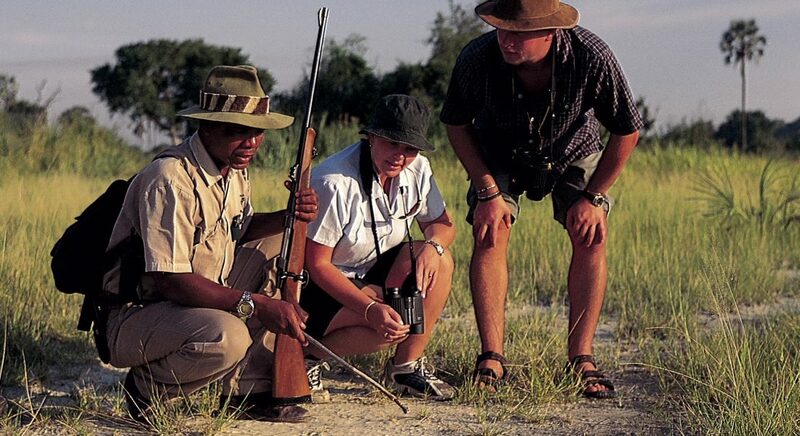 A variety of activities are included on this safari, but the primary activity is game driving. The wildlife is typically most active early in the morning and late in the afternoon (these times also provide the best light for photography), and therefore we plan our activities accordingly. Typically, one of the camp staff will knock at your tent door early in the morning, and the group will gather for a quick, light breakfast and coffee or tea before departing camp as the sun rises. We move slowly, and even when animals are not present, the landscape and sounds of the bush are entrancing. We spend a few hours exploring and observing animals at watering holes or on the move from one region to another. As we come upon groups of animals, we allow plenty of time to simply observe and also take photographs. Our guides are experienced naturalists and will add greatly to your understanding of the animals. We keep a respectful distance — although the same cannot always be said about the animals, and it is not unusual to come nose-to-car with baboons, zebras, wildebeest, gazelles, and elephants. By mid-late morning, we return to camp where a delicious brunch awaits. After brunch, we enjoy a few hours of down time, enjoying the amenities of camp, resting, birdwatching, taking photos, or perhaps reading about the region you are visiting. In the afternoon, we gather for hors d'oeuvres and drinks before heading out for the afternoon activity. Some days this will be another game drive, while other times we may board mokoros for a quiet exploration of the waterways near camp or explore the area on foot in the company of our guide and a ranger. "Sundowners" — a light snack and cocktails in the bush, are an African safari tradition, and a great way to enjoy unforgettable African sunsets. We then make our way back to camp, sometimes driving with a spotlight to look for nocturnal animals. In the evenings, dinner is enjoyed as a group, and will vary from seated meals ordered from the daily menu, to dining in the camp boma (a traditional protected outdoor dining area) with a feast of traditional African foods and entertainment by the camp staff. These are joyful performances where it is often difficult to tell who is having more fun — the staff or the camp guests! In the camps, the food is healthy, varied, and delicious, a feat when considering the logistics involved in servicing these remote areas with fresh fruits, vegetables, baked goods, and meats. To accommodate our morning and late afternoon activity schedule, several small meals and a few large ones are served daily. The pre-game drive early breakfast typically includes porridge, cereals, yogurt, fruit, coffee and tea; brunch includes typical breakfast fare accompanied by more savory items like sausage tarts, spring rolls, light lasagnas, and other eclectic choices; afternoon tea offers cakes, cookies, and savory items; "sundowners" are light appetizers and cocktails often taken at a scenic spot in the bush; and finally, dinner, ordered from a menu with two or three daily choices. Beef, pork, and chicken are the basis of most main dishes, with occasional opportunities to try indigenous meats like farm-raised springbok. While in the bush, transportation is provided in open-sided safari vehicles. Around cities, and for airport transfers, a shuttle van is used. Camps on this safari are reached by small aircraft that may be shared with other travelers. This is typically in a 12-seater Cessna Grand Caravan, although the exact plane size and type can vary based on group size. Brooks is a member of Botswana’s Bayei tribe, the people who introduced mokoros to the Okavango Delta, and grew up in a small village on the banks of one of the main channels of the Okavango Delta. Being “born in the bush,” as he says, he had a fascination with Botswana’s wild areas from a young age. Working in safari lodges, Brooks soon realized his heart was pulling him to the bush and started as a tracker before becoming a guide in 2000. With the combination of his friendly personality, superlative bush knowledge, and interests in astronomy, birding, and the diverse cultures of Botswana, Brooks helps guests truly see all Botswana has to offer. 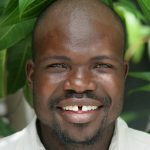 Olebogile (known to all as Ollie) was born and raised in Maun, Botswana. He comes from a long line of subsistence farmers, and his passion for and appreciation of nature and wildlife stems from his days as a small boy herding goats and cattle in the bush. After completing school, Ollie did his national service in the Department of Customary Law, and then enrolled in a professional guiding course at The Botswana Wildlife Training Institute. 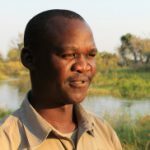 With over a decade of guiding experience all around the Okavango Delta, Ollie brings a depth of knowledge and enthusiasm for his homeland that is contagious. Optional easy walks; games drives on bumpy terrain. Some agility required for getting in and out of boats and vehicles.